Brothers Water is in the centre. 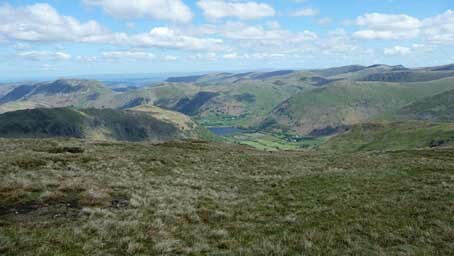 The spur on the left is Hartsop above How. The spurs on the right, closest first, are High Hartsop Dodd, Middle Dodd and Hartsop Dodd. On the horizon, from the left and largely ignoring the Pennines, are Place Fell, Boredale Hause, a bit of Ullswater, Angletarn Pikes (with Beda Fell behind and Arthur's Seat behind that), Loadpot Hill, Brock Crags (with Loadpot Hill behind and Cross Fell, highest of the Pennines, behind that), Wether Hill (and Pennine peaks Great Dun Fell and Little Dun Fell behind), High Raise, Rampsgill Head( with The Knott in front), Kidsty Pike (with Gray Crag in front), the gap of the Straits of Riggindale and the rise towards High Street. Larger version of this picture..